In 2014, Spinifex presented the BOLLYCORE project, featuring Priya Purushothaman, one of India’s most talented young vocalists, and virtuoso dancer Maya Sapera. The trademark Spinifex jazzcore/avantrock combines with Purushotaman’s intense lyricism to create a sound beyond East and West, avantgarde and tradition; a sound previously unheard and thoroughly enjoyable for lovers of Indian music as well as for fans of contemporary jazz. The visual aspect of BOLLYCORE is greatly enriched by the performance of Maya Sapera, who has a background in Bharatanatyam (south Indian classical dance) but who is also expert in Rajasthani gypsy dance and Bollywood styles. The Spinifex collaborations with prominent Indian musicians such as Dr. Mysore Manjunath and Dr. Suma Sudhindra have been very successful in recent years. 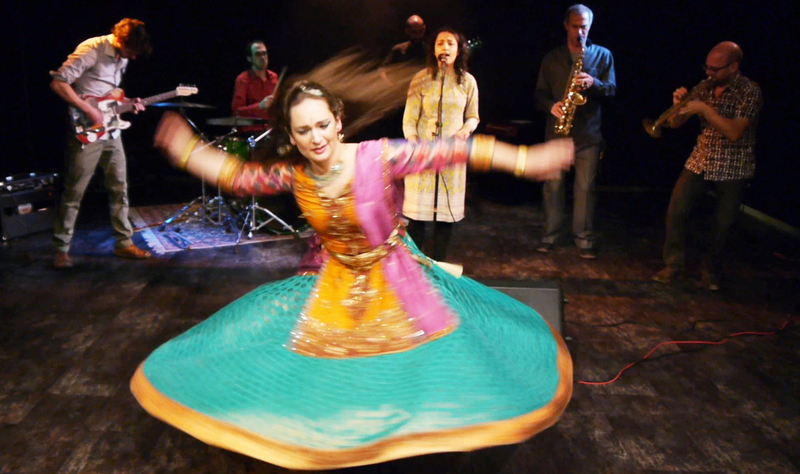 The ensembles toured India several times, performing at prestigious venues like the Delhi India International Centre and the Fireflies Festival of Music (the ‘Woodstock of India’). In the Netherlands, they played important festivals such as Music Meeting (Nijmegen) and Mundial (Tilburg). Ton Maas wrote in his 5/5 stars review in the Dutch daily Volkskrant: ‘Lots of fireworks and spectacular solos, but even more impressive was the ensemble playing, which fit together perfectly with uncanny precision even in the most rhythmically complex parts.’ Stef Mennens wrote in Jazzenzo: ‘Pure enjoyment for lovers of jazz and world music … who rewarded the ensemble with a standing ovation’.